Doha, Qatar, 30 October 2018: Massoun Insurance Services LLC. 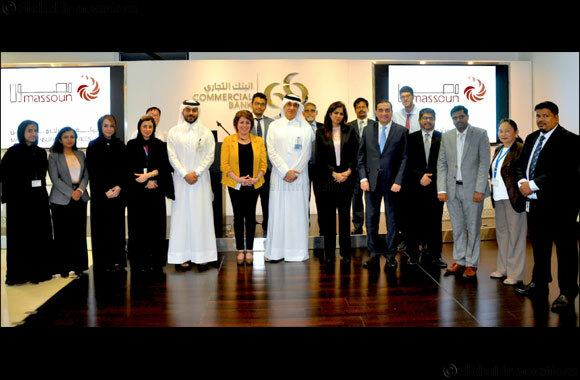 – a Joint Venture between Qatar Insurance Company (QIC) and its bancassurance partner Commercial Bank – recently hosted an interactive workshop with the Bank’s Wholesale Banking team. The session shed light on the achievements of Massoun over the years and detailed its future plans with Commercial Bank to further enhance its suite of insurance products and improve the client experience for its corporate customers. Held at the Commercial Bank Plaza building, the workshop served as an excellent platform for exchanging views and enhancing teamwork. Founded in the year 2010, Massoun is a joint venture between QIC and Commercial Bank. Registered with the Ministry of Economy & Commerce. Massoun is Qatar’s first bancassurance set up. With a team of highly experienced and dynamic insurance professionals, Massoun serves as a one-stop-shop offering a full suite of Retail & Corporate Customized Insurance Solutions for Commercial Bank & Non-Commercial Bank clients. Commercial Bank is a full-service bank that offers a wide range of corporate, retail and investment banking services. The Bank’s countrywide network includes 29 full service branches and 172 ATMs. Profitable every year since incorporation in 1974, continual investment in technology and human capital, together with a strong capital base, provides a solid foundation for its continued success.